It is extremely rare that soft tissues survive millions of years the way bones and shells do, so this new discovery is a doozy: palaeontologists have discovered what they think are the fossilised lungs of an ancient bird that lived 120 million years ago, in the Early Cretaceous. It’s a find that could help us understand not just the anatomy of ancient birds, but how those birds evolved over time to become the animals we know today. The bird itself was a starling-sized Archaeorhynchus spathula, and in itself is a rarity. It’s only the fifth ever speciman reported of this particular bird, and it’s an ancient member of the Ornithuromorpha lineage that leads to modern birds. But this specimen also stands out among those five other that have been found. Found in the Early Cretaceous Jiufotang Formation in China, it initially caught palaeontologists’ attention for its exceptionally well-preserved feathers, which revealed a tail morphology that had never before been observed in Mesozoic birds – but which is relatively common in today’s living birds. That is cool enough on its own – but then closer examination revealed structures in the bird’s chest that are “probable” fossilised lungs, the researchers said. The two slabs between which the fossil was smooshed show a two-lobed feature with an unusual white speckly region. It was unlikely to have been the contents of the bird’s stomach, which usually appear black and carbonised in fossils. And although birds’ livers are also lobed, they usually show up as reddish due to the high iron content. So lungs was the most likely explanation. And they revealed a surprise. 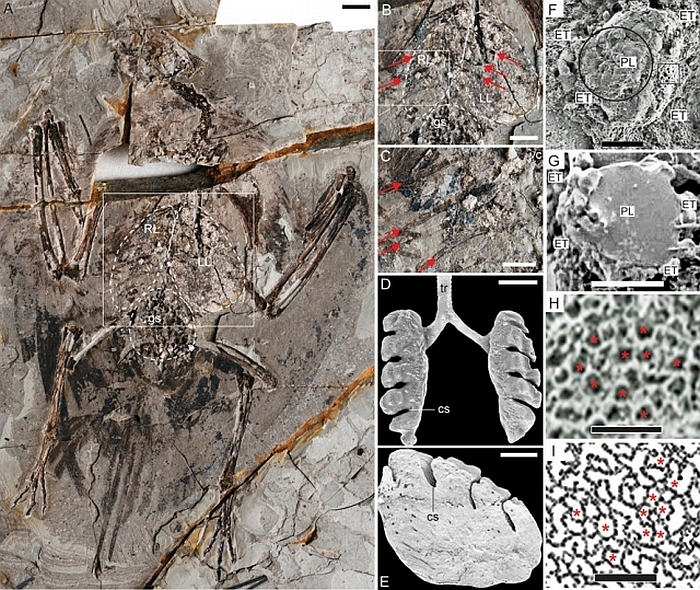 “The preserved morphology reveals a lung very similar to that of living birds,” the researchers wrote in their paper. Of all the current air-breathing vertebrates, birds have the most efficient respiratory system. Mammals respirate bi-directionally, breathing air in and out of the lungs, so that there’s always a mix of incoming and outgoing gases. Bird lungs are smaller, and they don’t expand and contract like ours do. Instead, they use air sacs like a bellows to push fresh air unidirectionally through the lungs. This means the air moving through bird lungs provides a higher oxygen content, to cope with the higher oxygen demands of flight. According to the team’s analysis, many of these structures are present in the fossilised lungs, which they found embedded in its rib cage, also in the manner of modern birds. Using scanning electron microscopy, the team examined 22 samples from the specimen, including 12 from the “probable” lungs. Of those 12 lung samples, seven revealed structures that resemble air capillaries called parabronchi, and a parenchymatous region that consists of closely packed minuscule air cells – similar to the air capillaries found in the lungs of small modern birds. Coupled with the bird’s tail, with the pinfeathers that appear in modern birds, the lungs provide some pieces to the puzzle of the history of birds. They suggest that these features may have given the Ornithuromorpha line of birds an edge that ensured the lineage’s survival during the Cretaceous-Paleogene extinction event of 66 million years ago, where many other birds didn’t make it. Soft tissue has a hard time withstanding the heat and pressure required to create a fossil, so other analytical techniques can and should be applied to confirm the team’s finding. But it’s also worth noting that, although rare, previous soft tissues have been recorded in Early Cretaceous bird fossils, including parts of the digestive tract, reproductive tissues, and foot tendons and ligaments. Palaeontologists have also recovered even older lung tissue. In 2015, they described the fossilised lungs of a mammal that lived 125 million years ago. The team presented their research at the Society of Vertebrate Palaeontology annual meeting in Albuquerque. It will also appear in the journal PNAS on 22 October.